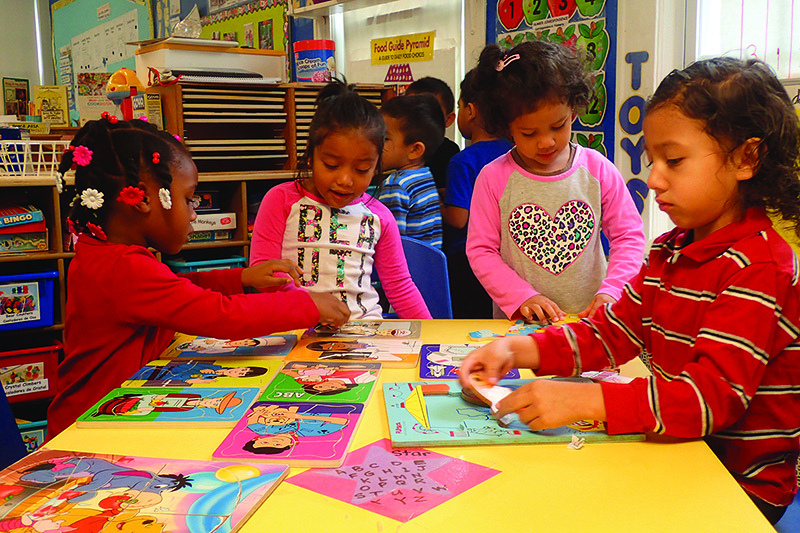 DEVELOPING THE WHOLE CHILD: Playing and academics are “a beautiful balance” at Princeton Nursery School, says Director Rosanda Wong. The school is about to celebrate its 90th anniversary of educating local children. Inside a plain yellow building on Leigh Avenue, generations of Princeton children have received their first taste of life in the classroom. Princeton Nursery School has been a mainstay in Princeton’s Witherspoon-Jackson neighborhood for nearly nine decades. Keeping the school in the neighborhood is key, added Wong, because many of the 46 students are from working families who live within walking distance. They drop their kids off at 7:30 a.m. and pick them up at 5:30 p.m., knowing they have had breakfast, lunch, and a snack — 261 days a year. Tuition costs $1,150 a month, but only one family currently pays the full amount, Wong said. Some of the families qualify for a subsidy. Some pay $20 a month; others pay $150 or more. On a recent summer afternoon, a table just inside the front door of the building was covered with fresh produce from the Mercer Street Friends Food Bank. Along one wall, shelves held shoes, clothing, and other donated items.